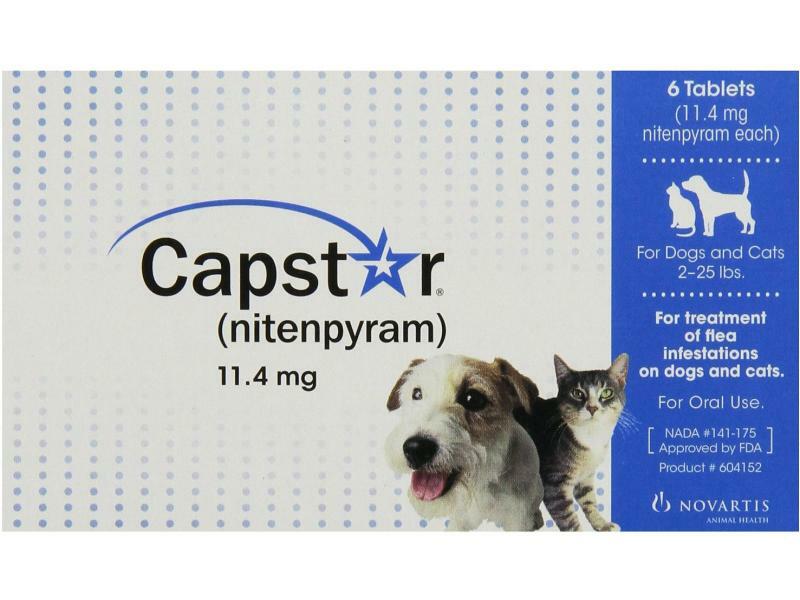 Capstar tablets are given to dogs and cats to kill any adult fleas present. After taking a tablet, fleas will start to die after just 15 minutes. All adult fleas present should be dead within 24 hours. Capstar is very safe for pets, but lethal for fleas. However it is important to remember that more fleas will tend to jump onto your pets as they move around the house and outdoors. Therefore it is always best to use some other form of flea control as well. An insecticidal spray used in the house is very effective, such as Indorex or Acclaim. Something to prevent fleas breeding can be given to your dog and cat too, such as Program. This is available without prescription and if used every month will prevent flea eggs from developing. It is safe to give repeated doses of Capstar tablets if more fleas are seen, but no more than one dose per day should be given. White to light yellow, round, biconvex tablets, with bevelled edges. Capstar 11.4mg tablets:11.4mg nitenpyram imprinted on one side with ''RB'', on the other side with ''CG''. Capstar 57mg tablets: 57mg nitenpyram imprinted on one side with ''HIH'', on the other side with CG''. 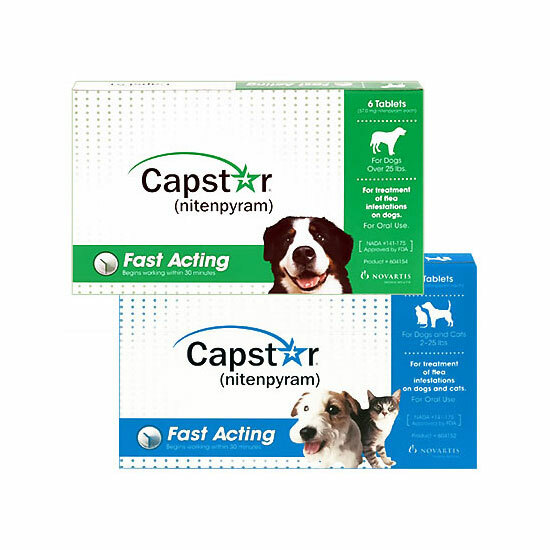 Capstar is indicated for the treatment of fleas on dogs and cats. Daily treatment for infestation plus environmental treatment. Fully effective in 6 days. Tablets fine to be crushed. 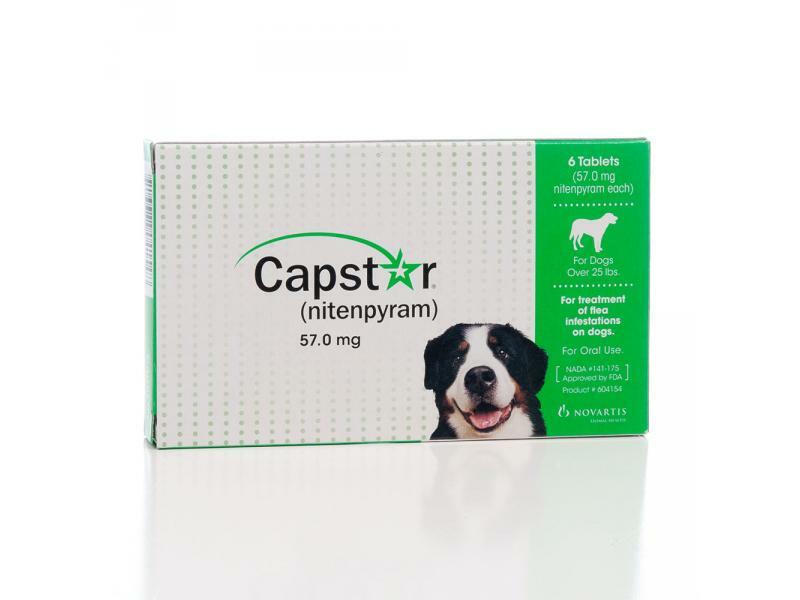 Capstar tablets should be given orally, either directly into the mouth or mixed into a small portion of food and given immediately. Administer on any day when fleas are seen on the animal. No more than one treatment should be given per day. Do not use on animals less than 4 weeks old or weighing less than 1kg. Do not use the tablets after their expiry date. Aluminium blister containing 6 tablets. Cardboard box containing 1 blister. Effects on fleas may be seen as soon as 15 minutes after administration. Between 95% and 100% efficacy is observed within the first 6 hours and 100% efficacy is reached within 24 hours. To help prevent re-infestation, the additional use of a suitable treatment to control immature stages of the flea life cycle in the environment is recommended. If in doubt consult your veterinary surgeon. Nitenpyram is neither embryotoxic nor teratogenic. It can be given to animals at all stages of pregnancy or lactation. No adverse drug reactions were seen when nitenpyram was administered with other products commonly used in small animal veterinary practice including commonly used flea products, vaccines or antibiotics. Overdose: nitenpyram is well tolerated. Overdosage up to 70mg/kg was asymptomatic. Below are some recent questions we've received regarding Capstar Flea Tablets for Dogs & Cats, including answers from our team. Yes, Capstar can be given at all stages of pregnancy or lactation. Administer these tablets on any day when fleas are seen on the animal. No more than one treatment should be given per day. These tablets are used for an existing flea infection. If you are wanting something for prevention, any spot on treatments would be suitable such as Frontline, Effipro and Advantage. Ensure you have your household flea spray too and we can recommend Indorex or Acclaim. 90% of fleas live in the environment and not on your pet so a spray for the environment is most important. Would half a tablet be sufficient for 12 week old kittens that weigh 1kg and just over or do they need a whole tablet when they are so small? Here is the dosage information. For a 1kg cat you would need to give 1 whole tablet. Can I use capstar with Fiprospot ? Yes, Capstar should be perfectly safe to use with Fiprospot. They contain different active ingredients which should not have any interactions, and none are advised in the data sheet- Capstar has been tested against many common pet products with no side effects. Capstar tablets have very short term effects but should not be used more than once per day. It is highly recommended that you treat the house and all pet bedding to get rid of the eggs and larvae that will be in your pets environment. The females lay thousands of eggs each day, so when they hatch, it can appear that your products are not working, when really they have but the fleas are being replaced with new ones! I would personally choose to use either Genitrix RIP Fleas Spray or Virbac Indorex Spray. Is it safe to use both Capstar and Advocate at the same time, with a heavy flea infestation. Yes it should be perfectly safe to use these two products together because they work in completely different ways and contain completely different ingredients, with no known interactions to my knowledge. I would say that theoretically you should not need to use them together, because Advocate should deal with fleas on its own. However if there is a heavy burden to get rid of, the Capstar should provide a dramatic immediate effect. The general environmental population in the background might act as a reservoir for a while, so an environmental flea spray such as Indorex could be considered.